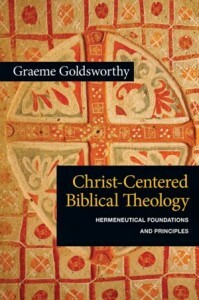 I recently read Graeme Goldsworthy’s Christ-Centered Biblical Theology (IVP, 2012) as part of my effort to grow in my understanding of biblical theology. My brother Dane has a more thoughtful and more detailed reflection on it, but here are some brief thoughts. I am still not sure whether the 3-stage view of Goldsworthy and Robinson (to whom the book is largely a tribute) is the most helpful model for doing biblical theology. Initially I approached this model with skepticism, having been more familiar with the epochal approach of Vos, Clowney, etc. in the past. John Murray’s tiny booklet called Covenant Theology was very influential for me during seminary in understanding the progressive nature of the biblical covenants from Noah, Abraham, Moses, etc. onwards. What gives Goldsworthy’s proposal some merit for me was his insight into the fundamentally upward and then downward trajectory of the OT before and after Solomon. This sentence, for example, gave me pause: “nothing happens after Solomon in the history of Israel to improve the glorious pattern of the revealed kingdom and the way of salvation” (148). I hadn’t considered this before, and its an intriguing point. I also think Goldsworthy has a point that the role of David is neglected in some biblical theologies. I wonder if the same can be said for the role of the exile? At the end of the day, I’m not convinced that the evidence as a whole points toward Goldsworthy’s proposal, but reading this book helped flesh out my understanding of the Bible in more detail and nuance. When I think about biblical theology, I’m now thinking about how to incorporate the up-down movement of the OT along with its successive covenants. The strangest part of the book was Robinson’s application of biblical theology to water baptism with the resultant suggestion that baptism is an adiaphoron (a matter of indifference) on p. 213. This seemed like a very odd and unhelpful conclusion. Goldsworthy has a great insight that exemplary approaches to OT stories like David vs. Goliath are also typological in that they see David as a type, not of Christ, but of every believer (30). In other words, the issue is not whether we use typology, but how it works. I also thought he helpfully rebuffed the misuse of Hebrews 11 to argue for a purely exemplary approach to the OT by pointing out that OT saints are exemplary to us insofar as they exercised faith in Christ: “looking to Jesus, the founder and perfecter of our faith” (Hebrews 12:2). The faith they modeled was a specifically Christo-centric faith (there is no other kind of faith). The bottom line for me after reading this book: I’m definitely convinced of the value of biblical theology. I’m not sure how someone could believe in an evangelical doctrine of biblical inspiration and not be inspired to pursue it (especially in light of texts such as John 5:39, II Corinthians 1:20, and Luke 24:27). I want to keep growing in my understanding of how it operates. I think having a good grasp of biblical theology makes a huge difference in preaching. I think the best way forward is probably just to keep reading the Bible itself over and over, constantly asking about how the parts and the whole relate, and keep preaching from OT texts, asking God for help. I feel like there is so much to explore in this field.